Before joining Los Angeles magazine, I wrote a story for another publication on Belizean cuisine, which included—at the time—L.A.’s only Garifuna restaurant, Wadabu. As a matter of fact, it was the only one of its kind west of Chicago’s Garifuna Flava. The story sat on the editor’s desk long enough for South Central’s fledgling Wadabu to close, but by then another restaurant run by a Honduran Garifuna called Restaurante Sabor Garifuna miraculously sprang up, so I rewrote the piece. By the time we were close to publishing, Jacho’s, too, had closed. I never got to write about either of those unique places and we scrapped the whole Garifuna segment. Finally, the Saraba food truck has come to heal my pain with dishes this city hasn’t seen in a long, long time. The Garifuna, or Garinagu, are descendants of West and Central Africans, Island Caribbeans, and Arawaks that intermarried on the island of St. Vincent. They were exiled by the British in the late 1700’s to the Central American coasts of Belize (in Dangriga, where Winston’s family is from), Guatemala, Honduras and Nicaragua. I’ve attended many Garifuna events in South Central Los Angeles over the last four years—South Central has a sizable population of Garifuna, mostly from Belize—and sampled their interesting and delicious cultural dishes. There’s hudutu (sour, mashed green banana shaped into a large ball) served with sere (fish soup), sweet or sour darasa (tamal of green banana), cassava bread, tapado (seafood, green bananas, and root vegetable soup), and even homemade bitters to sip to the sounds of Punta Rock. 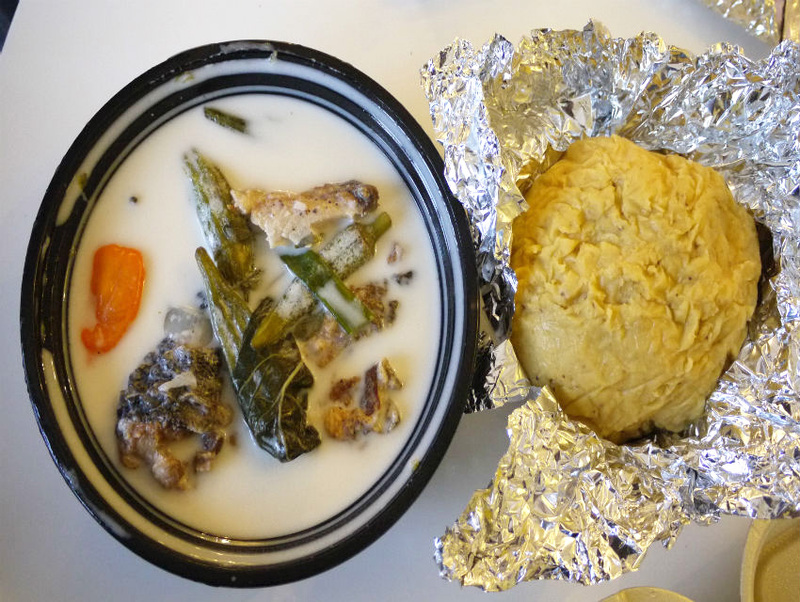 Saraba—which means “wake up” in the Arawakan based Garifuna language— offers traditional Belizean dishes as well as uniquely Garifuna items like hudutu. The owner, Winston Brandon Miranda, the son of a Honduran and Belizean Garifuna parents, will be ready to hit the Hollywood club scene after the new year; until then, he’s catering events. On Sunday night I caught him at the Savoy Entertainment Center in Inglewood for a weekly Belizean club night complete with Belizean hip-hop, Cîroc bottle service delivered by hostesses holding up sparklers, and Belizean comfort food. Rice and beans cooked in coconut milk with a side of potato salad is the national dish of Belize, which is finished off with stew chicken or fish with plenty of sauce to wet down and season the starches. Winston also unwrapped Belizean-style jerk chicken and oxtails braised in a wine and Worcestershire sauce from foil packets, mixing smells of Caribbean spice with reggaeton beats to summon hungry club goers. The menu isn’t set yet but Winston will be serving various Garifuna dishes, Belizean kriol classics, and Mayan snacks like panades (paprika seasoned tortillas filled with tuna), garnaches (bean and cheese tostadas) and salbutes (shredded chicken on a fried tortilla). I waited for over an hour, until after midnight for Winston to set up, because after four years of patient regret, I can finally announce that L.A. has Garifuna cuisine.